Dr. Julie Spencer completed her undergraduate degree and Doctorate of Veterinary Medicine at Michigan State University. 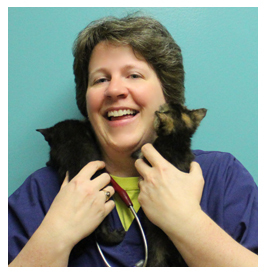 She practiced at several veterinary clinics in Ann Arbor for 12 years prior to joining HSHV 7 years ago. Her main job at HSHV is working as the Foster veterinarian. She enjoys golfing, attending UM softball and women’s basketball games, and gardening. She and her partner own 5 cats – 3 brothers (Pete, Ron, and Harry) and 2 cats who started as kittens they fostered (Montana and Sable).